"This amplified version of Congress Street IPA is a focused exhibition of the Galaxy Hop. Milky and yellow-orange in appearance, Double Dry Hopped Congress Street emits fragrant aromatics of mango, pine resin, grapefruit, pineapple, and peach. Explosive flavors of tropical fruit, grassy hop, nectarine, orange rind, and creamy malt inundate the palate with a thick, rich mouthfeel and soft, effervescent carbonation. The finish is full and oily, yet clean, with a light, modest bitterness"
Trillium's "Street" series of IPAs focuses on showcasing one hop variety. Each "Street" beer is the malt bill, but utilizes a different hop which really lets you see how individual hops taste. Many moons ago I reviewed Congress Street IPA and it was a great use of Galaxy hops. 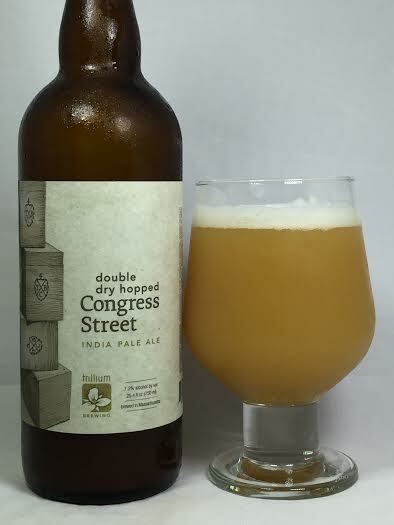 This time around, Trillium has jacked up the amount of Galaxy used to give us DDH Congress Street. I've had this many times, but this is finally the review for one of my favorite Trillium beers. It pours like a light orange milkshake with two fingers of white head. Usually if you hold these murky IPAs up to the light you will at least have a glow of orange, but in this case, absolutely no light gets through. The aroma is a lovely bouquet of dank, weed-like hops, peaches, pine trees, and acidic grapefruit. I think I might have cracked a rare smile when I poured this into the glass...maybe. A lot of times with these New England (or Massachusetts really) IPAs, they turn out to be juice bombs. Not that there's anything wrong with that, but as much as I do prefer an atom bomb of citrus, I do wish for these IPAs to strike a balance between the juice and actual hop flavor. DDH Congress Street has answered my prayers. The first initial wave of flavor is dank hop oils, resin, and just overall pure hop juice. Once it crashes over the middle of the mouth, the full moon transforms this into a beastly offering of peaches, lemons, and apricots. There's tons of acidic citrus on this with fresh-squeezed grapefruit and oranges coming at you at an unrelenting pace. Near the back there's also come bubblegum/juicy fruit flavors and a pinch of doughy/bready malts. The lasting taste after each sip goes back to the dankness of the hops and it leave you wanting more. Mouthfeel is mostly dry, but not a desert in your mouth. It also feels full and creamy without having a syrupy quality associated with bigger IPAs and DIPAs. The body is full for a 7.2% IPA and it makes full use of its weight. A big feel and bigger hop presence might come off as intimidating, but it's so flavorful that it makes drinkability pretty high. The use of Galaxy hops in DDH Congress Street is one of the best I've ever experienced. Galaxy provides such a great combination of citrus and dankness that it is easily one of my favorite varieties. When a brewery decides to just throw a shitload of it into an IPA, the results could be overpowering. In this case, Trillium has hopped the beer with finesse and produced a flavor profile that is hard to match in an IPA. A near perfect combo of juice and hops you should seek out.